If you were to do a search on Google for the name John Russel, most probably you will find the web site for the Power4Home e-book. Power4Home is fast becoming one of the top selling manual for Do It Yourself (DIY) home renewable energy guide on the web. But who is John Russel exactly? 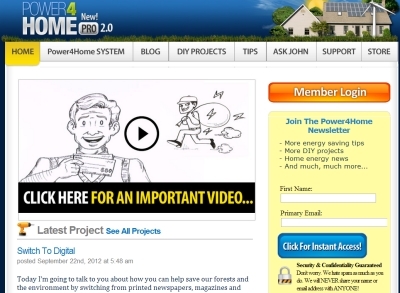 Reading the web page of Power4Home, it says John is a 46 year old home energy expert from Minnesota. Apparently, his greatest achievement is reducing his home electricity bill by using renewable energy sources such as solar and wind power. Here’s a fact that many people many not know about e-book publishers on the web. Most publishers will use a marketing person to tell the story about their book or product. Effective selling on the internet is all about telling a good story. The same principle was explained very well in Seth Godin’s All Marketers Are Liars book. Seth is a genius marketer that gives marketing lectures all around the world. He is also the proprietor of Squidoo.com. Selling on the web is very different from selling in a retail store. There are virtually unlimited choices. To stand out from the crowd, the marketing people have to find a way to tell a good story. The funny thing is, we as consumer, want to listen to the story before we make a purchase! Coming back to the John Russel character, I bet he is a person created by a marketing agency to promote the Power4Home e-book. He may or may not even be a real person. In doing so, is it morally wrong? It depends on how you look at it. I have a copy of the Power4Home manual and I also learned a lot from the high definition (HD) instructional videos that comes together with it. Would I feel cheated if I know John Russel is not a real person? Actually, I couldn’t care less! What I wanted is the information and content on how to make an inexpensive solar panel and wind turbine for my home. I don’t really care about the packaging of the e-book. If you think about it, John is part of the outer packaging for the Power4Home guide. Are you more concern about the packaging or the content of an e-book? If you are looking for useful information on homemade solar and wind generator, check out the Power4Home web site. They did a good job telling a story. I ordered this. They said I would receive a DVD, 3 manuals so I could look things up while I was working on it. also a bonus and an email address to contact them if I ran into a problem. All I reveived was 1 DVD no paper work with a email address no way to reach them. I have been unable to get a response from them at all. It is a scam. He claims you can build a solar panel to run your house. For 100.00 dollars. Not going to happen. The average home would need around 15KW. He also claims to supply you with a wind turbine that will deliver a whopping 450 watts of power. 450 watts will not even power a coffee pot. He fails to mention the price of the equipment. To hook it all up to your house. I have 40 years in the power systems field. It is a total scam.